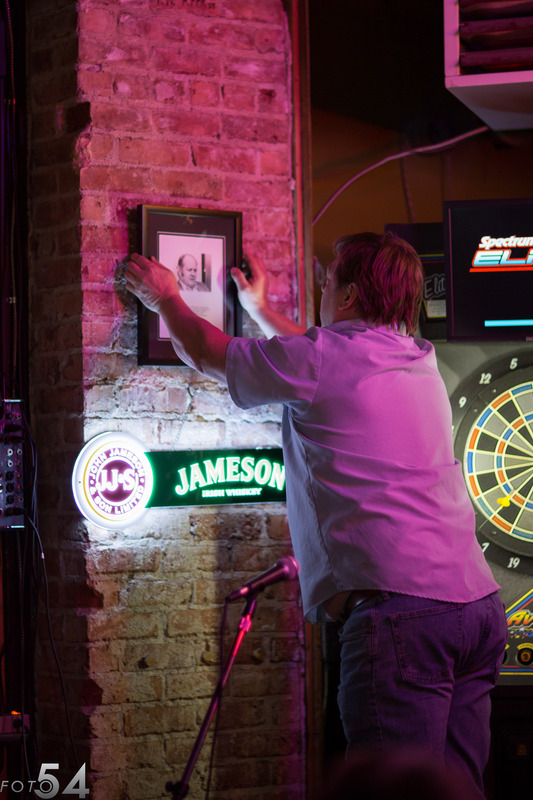 Mac's Triangle Pub owner Geoffrey "Mac" McElroy places a framed photo of famed poet Richard Hugo on the wall during the "Homage to Richard Hugo Night" Dec. 21. Likely the most famous person to come from White Center, celebrated poet Richard Hugo, was remembered in a special gathering at Mac's Triangle Pub on what would have been his 94th birthday Dec. 21. Dozens packed into the classic tavern on the edge of the community to hear his poems read and to witness the unveiling of a framed photo in his honor. “Homage to Richard Hugo Night” paid tribute to one of the Northwest’s most influential poets. The poet who attended the University of Washington and later went on to live in Missoula Montana died in 1982. The unveiling was followed by readings from Hugo’s poems and essays about Hugo. Nicholas O’Connell, founder of www.thewritersworkshop.net, read from On Sacred Ground: The Spirit of Place in Pacific Northwest Literature and White Center resident Jeff Smoot read from his essay, “Finding Richard Hugo in White Center,” forthcoming from the online literary magazine www.thewritersworkshopreview.net; and other poems/ stories about White Center and/or Richard Hugo. Hugo born in 1925 was largely a working man's poet. He became widely admired inspiring many aspiring writers. Teaching at the University of Montana, and through his book, "The Triggering Town", a collection of his essays and lectures that were “directed toward helping [the writer] with that silly, absurd, maddening, futile, enormously rewarding activity: writing poems” he hoped to reach beginning poets and others. Hugo was a bombardier in World War II and returned to study with Theodore Roethke at the University of Washington. After graduating, Hugo found employment as a technical writer at Boeing and while his poetry was underway he didn't publish his first book until he was 37. The majority of his last 20 years were spent teaching creative writing at the University of Montana. As stated by the Poetry Foundation Hugo's work was noted "for the tight, rhythmic control of his language and lines and for the sharp sense of place evoked in his poems. Hugo's images are urgent and compelling; he imbues the many minute or seemingly irrelevant details found in his poems with a subtle significance, thereby creating a tension between the particular and the universal. This tension is considered central to Hugo's most powerful poems." Today the Hugo House is still engaged in his mission to "read words, hear words, and make your own words better." You can take part in upcoming events at the Hugo House through their Events Calendar.